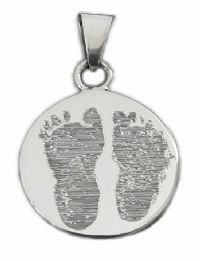 Our sterling silver extra large round pendant is custom engraved with your loved one's actual handprint and footprint images for a truly one of a kind personalized keepsake. 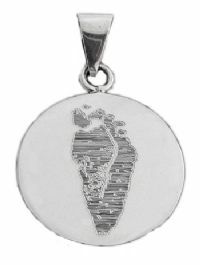 This Sterling Silver Xtra Large Round Pendant can be engraved with 2 handprints,� 2 footprints, or 1 Handprint with 1 Footprint. Select the custom image�you'd like engraved on this pendant in the drop down box below. A name can be inscribed under the image, Or you can just opt for personalization on the back for a larger image engraved on the front of the pendant. The Back of the�pendant can be engraved with�names, dates or a special saying. Fill out the text box below with the desired inscription. Sterling Silver XL Round Pendant measures 26mm diameter. If additional prints are chosen for the reverse side, only�1 line of engraved personalization can fit on each side. The best quality image reproduction is from dark, high contrast ink prints against a white paper background. If you are going to create new handprint or footprint images, you can use black washable ink and plain white cardstock (without any decorative textures or backgrounds). These can usually be found at your local crafts store. We also sell a no-mess, no-fuss Inkless Wipe Kit�with specially coated paper that you can create your own prints with. Please allow 2-3 weeks for your custom charm to be made.�Holidays such as Christmas, Mother's Day and Father's Day have specific cut off dates to order by, to ensure the proper time required for processing and shipping. Please see our Holiday Ordering Dates page before placing your order.